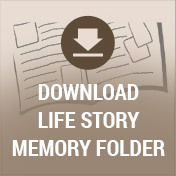 A luncheon will follow the burial in the Life Story Center. Throughout her rich and rewarding life, Georgia Pinto was a blessing to everyone she met. She faced times of trial to be sure, but her unwavering faith was a genuine inspiration to all who were near. 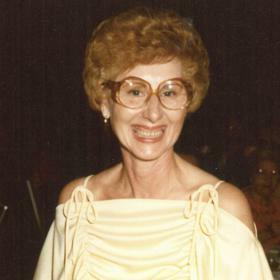 A more devoted family woman would be hard to find, and Georgia was filled with unspeakable joy to witness her family tree blossom to include the branches of grandchildren and great-grandchildren she adored. Life will never be the same without her here, but she leaves behind a timeless legacy that her loved ones will proudly carry on in her footsteps. It was great to be an American during the exciting decade of the Roaring Twenties. Jazz music, ballroom dancing, and motion pictures in both color and sound were all noteworthy events that colored the cultural fabric of our nation during this time. Amidst this colorful time was a time of great joy in the lives of Method and Anna (Baleja) Jerabek as they announced the birth of the baby girl they named Georgia on October 24, 1925, in River Rouge, Michigan. She was the second of four children as she was raised in the family home in a poor neighborhood outside of Detroit alongside her older sister, Anna, and her younger siblings, Edith and Matthew. Her father was a shoemaker who emigrated from Czechoslovakia while her mother was busy homemaker. From the time she was a young girl Georgia proved herself to be extraordinary. She helped raise her younger siblings while also caring for her epileptic mother. Georgia became very close with her siblings and remained that way for the rest of their lives. Brilliant and hardworking, she graduated as the valedictorian of her high school class. She was one of only three students from her graduating class to go on to college, and she was the only woman. Georgia put herself through college at Wayne State University, studying music and violin. As a young woman, Georgia was eager for all that life had in store. She taught elementary school music and became accomplished in secretarial and bookkeeping skills, supplementing her income during summers using these talents. It was at one of these summer jobs that Georgia met her future husband, Alexander Vincent Pinto. He was a skilled tool and die engineer, working at his brother’s manufacturing plant in Detroit where Georgia was hired. Georgia was 20 years old, and Alex was 11 years her senior. They began dating and soon found themselves deeply in love. 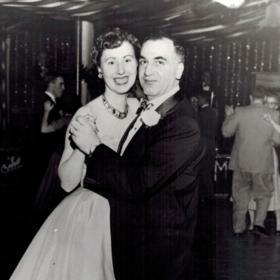 With a desire to spend the rest of their lives together, Georgia and Alex were married on November 22, 1947, at St. Vincent DePaul Church in Detroit after she graduated from college that same year. A short time later, their first of 12 children were born as they welcomed their son, David Alexander, into their hearts and home in 1949 while they were still living in Detroit. In 1950, their family moved to Kalamazoo where Alex purchased the Globe Casket Co building to establish his own skilled tool and die business, American Tool Company.  Over the next 22 years that followed, Alex and Georgia experienced much joy and love as they were blessed with the births of 11 more children including Isabel, Cheryl, Alexander Jr., Matthew, Michael, Carmen, Joseph, Anna Maria, Therese, John, and Gina. They experienced numerous peaks and valleys together and gave glory to God for His strength during hardship as well as His many blessings. Alex founded a second manufacturing plant called Michigan Products in the mid-sixties, which he ran until his sudden death in 1972 when he was just 58. All of their children were still living at home at the time of his death, leaving Georgia as their only caregiver and to support her large family on her own. There were numerous demands that came along with raising 12 children as a single parent, and the financial responsibility was also a harsh reality of Georgia’s life on her own. Their older children worked to help provide financial and emotional support, and at the age of 47 Georgia entered the workforce again. She initially worked as a library aide in the Kalamazoo Public School system and then as a school secretary until heart valve replacement in 1995 forced her into retirement at the age of 70. Georgia’s faith was a constant presence in her life. She was a member of St. Joseph Catholic Church, and over the years she attended St. Monica and St. Augustine Catholic Churches. Georgia’s children received their education from their Catholic schools, and as a mother Georgia supported and encouraged her children to pursue college. With her support, 11 of her 12 children have a college degree. The trials in Georgia’s life would seem to bend her to breaking her point, but they never did. She always rose up to embrace the struggle and the joy of being alive while also loving her family and friends. Over the years Georgia weathered financial crises, congestive heart failure, a heart valve replacement, breast cancer, and the premature death of two of her grandchildren. There was no doubt that it was her faith that carried Georgia through these trying days. 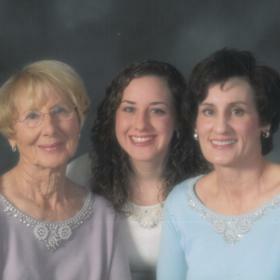 In everything she did, Georgia’s family was her greatest source of joy. She was a hostess like no other, and her skills were legendary with such a large family to care for. As her family grew, Georgia was adamant about getting the entire family together at least two times a year, especially for Christmas. She planned, shopped, cooked, wrapped gifts, decorated, and eagerly awaited the arrival of her loved ones. Dinners were always noisy and eventful, but they were also joyful and fun for all who were there. As her family can attest, these gatherings always included Georgia’s homemade ravioli. It has been said that Georgia was a legendary grandmother and great-grandmother. 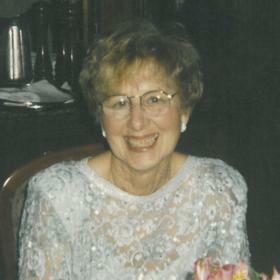 She was affectionately known as ”Gigi” among her 29 grandchildren and five great-grandchildren. Although the majority of her time was focused on her loved ones, Georgia also found time to pursue some of her own interests. Her love of music permeated her entire life. Of course her children had the option of playing their instrument of choice, and somehow Georgia always found a way to pay for music lessons. She loved all classical music, but Frank Sinatra and Dean Martin were her passion. Georgia played in the Kalamazoo Symphony Orchestra later in life until her arthritis robbed her dexterity. When she was older, she enjoyed traveling with her children, siblings, and friends, visiting many American cities along with France, Germany, and taking a Caribbean cruise. All who knew Georgia Pinto would agree that she was truly beautiful on the inside and out. She was hardworking, determined, and resilient with an unending spirit of generosity that never ran dry. Georgia remained joyful in all things, and her faith was the compass she used to direct her steps. Deeply loved, she will be forever missed. Georgia Pinto, of Kalamazoo died Thursday, December 14, 2017, in Kalamazoo. Georgia’s family includes her 12 children: David Pinto, Isabel (Ed) Ptak, Cheryl Pinto (Dan Martin), Alexander Pinto Jr., Matthew (Cathy) Pinto, Michael (Susan) Pinto, Carmen (Debra) Pinto, Joseph (Susan) Pinto, Anna Maria (Joe) Richardson, Therese (Michael) Meisling, John Pinto (Gretchen Allison) and Gina (Michael) DeMeyere; 27 grandchildren; 6 great-grandchildren; and many nieces and nephews. In addition to her parents, she was preceded in death by her husband, Alexander Vincent Pinto in 1972; sister, Anna Bren; and 2 grandchildren, Michael Alexander II and Angela Pinto. Visitation will be Tuesday from 5-8 p.m. at the Betzler Life Story Funeral Homes, 6080 Stadium Drive; Kalamazoo. Mass of Christian Burial will be celebrated at 10:30 a.m. on Wednesday at St. Monica Catholic Church. Interment Riverside Cemetery. Please visit Georgia’s personal web page at www.BetzlerFuneralHome.com, where you can archive a favorite memory or photo of her and sign her online guestbook before coming to the funeral home. 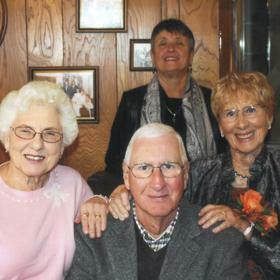 Memorial contributions may be made to Rose Arbor Hospice.